Mercedes-Benz 300D Car Starter Repair at your home or office. Mercedes-Benz 300D Car Starter Repair costs $395 on average. 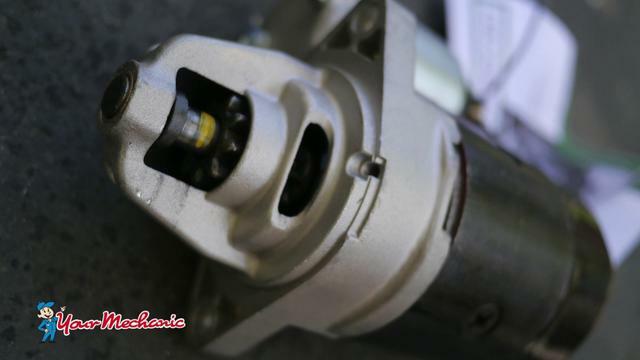 What's a car starter motor and how does it work? The starter motor is a powerful, compact electric motor that will turn a car’s engine over at about 200 RPM in order to start the engine. The starter is at the terminus of a circuit that includes the battery, the ignition switch, a neutral safety switch, relays and fuses. When you turn the ignition key to start, or press the start button in some vehicles, the starter circuit is completed and the starter will run. Most starters have a small pinion gear that engages a larger ring gear on the flywheel when the starter is powered on. The pinion gear turns the engine flywheel at about 200 RPM. Since the flywheel is directly connected to the crankshaft, all engine components will then turn in sync and the engine starts. When to replace the starter? Intermittent operation of the starter. Starters can develop bad spots on the armature which will cause intermittent operation. This causes the starter to work sometimes and other times when you turn the key nothing happens. Starter turns too slowly. Internal electrical and mechanical faults can cause the starter to draw too much current and in some cases the current drawn will exceed what the battery can supply. A consequence is the engine may not start as rapidly. Unusual noises on starting. If you hear any type of grinding or other unusual noise while starting the engine, that should be investigated as the noise could reflect an internal starter failure or the noise could be due to pinion gear failure or flywheel ring gear damage. Starter doesn’t function when turning the key. In some cases, the first symptom of a starter malfunction is a complete failure of the starter motor. This happens when you turn the ignition key to start the car, the starter motor does not function at all. How do mechanics repair the starter? If the starter is determined to be faulty, the battery must be disconnected prior to commencing any work. Once the battery is disconnected, the wiring to the starter is disconnected. Starters are bolted to the engine block or the transmission case. Generally, there are two bolts. The procedure to access the starter varies across car models and can require removal, or lowering, of other vehicle components. Once the starter is removed and a new starter is installed, the mounting bolts are tightened to the OEM factory torque specifications, the electrical connections are cleaned and re-attached to the starter and the starter is tested to confirm normal operation. Is it safe to drive with a starter problem? Once a vehicle engine is running, the starter is not in use. However, if you know that the starter is malfunctioning or working intermittently, you may be left stranded if you turn the engine off and the starter doesn’t function when restarting the engine. Should you know or suspect a problem with the starter, it is best to have the problem repaired to avoid being left stranded. Prior to replacing the starter, simple diagnostic tests should be performed to ensure that the problem is a faulty starter versus a weak battery, faulty neutral start switch, or other faulty electrical component in the starter motor circuit. Starters draw large amounts of current from the battery, much more than any other electrically powered device in your car. This makes it important that the electrical connections to the battery are inspected, cleaned, and tightened as necessary. Cables to the starter should also be inspected for corrosion and replaced as needed.